Professional Team Foundation Server 2010 is now out! In the year since the release of TFS 2010, we’ve seen a run of great new books coming, all by authors who really know their subject matter extremely well. At the beginning of the year, Sayed Ibrahim Hashimi and William Bartholomew published Using MSBuild and Team Foundation Build, the book on MSBuild and TFS Build. Then Mickey Gousset, Brian Keller, Ajoy Krishnamoorthy, and Martin Woodward brought us Professional Application Lifecycle Management. My copy of that book came in handy when I wrote a post on using the code metrics power tool with TFS Build. It covers the full range of the VS ALM 2010 product. 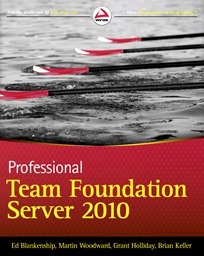 Now Professional Team Foundation Server 2010 written by Ed Blankenship, Martin Woodward, Grant Holliday, and Brian Keller is now out. I got my copy the other day and highly recommend it. Martin wrote a great blog post on the book, and in it he describes the differences between Professional ALM and Professional TFS. People have asked us what’s the difference between the ALM book and the Pro TFS book. The ALM book was deliberately written as an overview to the huge amount of functionality available in the entire Visual Studio Application Lifecycle Management suite. Though there are a couple of chapters, the Team Build one in particular, that get pretty technical – the Pro ALM book tries to keep things approachable by everyone. The Pro TFS 2010 book is a deep dive on TFS. We tried to make it so that you can pick up the book having never used TFS before any by the end of it not only know how to use TFS but how to administer a complex TFS instance and even use it to study for the TFS Administration exam. I’ve learnt something from every single chapter in the Pro TFS book, but I would also hope that someone new to TFS could pick up the book and learn just enough to get going then come back for more over time. They’ve included information on every major area of TFS and have included some coverage of the test features that integrate with TFS. One of the things that makes the book great is that it includes some great information on features of the product you may not even know about. For example, did you know you can use Active Directory to automatically configure version control proxies for your distributed teams (check out chapter 24)? Want to understand your server’s health and diagnose performance issues (see chapter 21)? Jeff Levinson’s Software Testing with Visual Studio 2010 covers the testing features of VS ALM 2010, which was a huge area of focus for us in the 2010 release. In it he covers creating test cases, reporting, and lab management, which is a powerful and complex new feature in 2010. In May we’ll get Professional Scrum with TFS 2010, so stay tuned for more.